People often ask how it all began. This chairlift company I started was a simple family affair and a pure accident that occurred when my own mother was searching for products to make her life easier. Here she is - now absent but always present. Doreen was faced with two extremes - shops who had no real interest or idea - to the heavy pressure boys, who wanted to camp out in her home for hours and try to extract thousands of pounds for something that should really cost hundreds. I could see there was a huge gap for a business to compete with the 'hard-sell' mobility product companies. And with such a lack of high street homecare products specialists, I had the perfect idea. As a result we started locally at Newcastle under Lyme on the edge of Stoke on Trent (easy Google map of us is at the bottom of the page) - And then we went national throughout Great Britain and Spain - and by golly it worked. 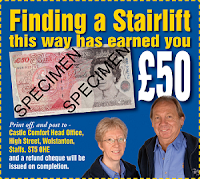 I was more than happy with modest profits and this soon caused the stair lift industry to offer low prices to compete. Straight and curved stairlifts have been installed all over the UK, recently in London and the home counties too in Kent, Suffolk and Surrey, and as far north as Scotland. Castle Comfort Stairlifts have always had simple policies - make life and business fun ... smile and as a result have developed a special website to make folk do just that. Take a look. Secondly and more importantly - all Castle Comfort's staff by instinct treat any client as they would treat their own parent or grandparent. I never forgot my failed aim to be a journalist as a child and being the type rarely to give up, there was an opportunity to belatedly achieve this by the back road. If no one would give me a job writing - then I was to have my own newspaper. And I made myself editor! This personal whim produced a remarkable marketing phenomenon. Read Castle Comfort' very own newspaper. At Castle Comfort, we religiously log the 'SOL' (the source of lead) of every single order or enquiry. We know exactly how and why a new or potential client approached us. The Clarion is, by far, the biggest single SOL. 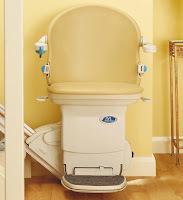 Simple and honest marketing policies and ensuring that none of the staff at Castle Comfort Stairlifts treat a client any different than they would their own parents, means the company is proud to be covering the whole of the United Kingdom and Spain with its stair lifts. Every Tues, Wed & FridaySouth Staffordshire Run. As ever, Castle Comfort directors Ann or Keith or Dr Stirling are waiting to assist. The best postcode to find us if using a satnav is ST5 8BW. We are the light blue building on the corner opposite the small Asda on Morris Square, Wolstanton. More than stairlifrs from this business! I woke today to find a flat tyre on my scooter and couldn't get out. So I called the place in Newcastle town centre where I got my electric scooter from to find they have disappeared leaving an empty shop. I phoned 3 other moblity firms and the only one that was bothered was Castle Comfort who came out straight away and sorted me out. Very impressed - when I need a stairlift they will hear from me again. Gladys Whittaker, Hanley, Stoke on Trent.